The championship trap shoot for the Nebraska State High School Rodeo Association is sponsored by the Four Rivers Sportsmen’s Club in Hastings and will be held on June 16. The rodeo takes place at the Adams County Fairgrounds in Hastings June 16-18, with the finals round on the June 18 at 1 p.m. The top four winners in each event qualify for the National High School Finals Rodeo, which will be held July 17-23, 2016 in Gillette, Wyo. For more information, visit adamscountyfairgrounds.com or hsrodeo-nebraska.com, or call (402)462.3247. KayLee Rasmussen may not be Annie Oakley, but the boys really don't care to shoot against her. 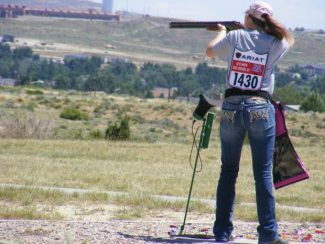 The Burwell, Neb., cowgirl, a member of the Nebraska High School Rodeo Association, shoots trap and, in a shoot-off last year, was the 2015 reserve champion trap shooter for the association. The quiet 17-year-old has grown up tagging along with her dad, whether they are at her grandparents' ranch or hunting. She's her dad's right hand man. "If I'm not outside with Dad, I'm outside doing something Dad asked me to do," KayLee said. They hunt Canada geese and ducks together, spending a weekend each year along the North Platte River near Bridgeport, Neb. She's shot a few ducks her dad misses, and often they go out and shoot trap just for fun. Her dad will challenge her, and she says, "OK, I'm up for the challenge." But it was at the state high school trap shoot last year where KayLee shone. Out of 25 shots, she made 23, only missing two. There were a bunch of boys watching, who had just shot light rifle. "They were dragging their feet," her dad Scott said. "They were hoping the darkness would help them (shoot better), which it didn't." Another trap shooter, Boyd Sawyer from Thedford, also shot a 23. So to determine the champion, the two went into a shoot-off. KayLee didn't fare so well in the shoot-off. "I shot eleven out of 25," she said. "I had never shot under the lights before, and I had never been in a shoot-off like that before, so I was really nervous." Boyd shot 17 out of 25, making him the state champion for the second year in a row. But as reserve champion, KayLee also got to compete at the National High School Finals Rodeo in Rock Springs, Wyo. Her practice rounds went better than competition, but the experience was worth it. "It was awesome to go there and see all the other kids that competed," she said. "I learned you can go and have fun, and make new friends. It was cool to see all those other kids from different states and make friends with them." KayLee is active in her 4-H club as a Youth Representative and Shooting Sports Ambassador for Nebraska. As a junior at Burwell High School, she is part of her school's FFA chapter, plays basketball, shows beef cattle and goats in 4-H and is on the GLW Children's Council. She also does the barrel racing, pole bending and breakaway roping in high school rodeo. Boyd, a senior at Thedford High School, wasn't that surprised that a girl did well at the state trap shoot. "There's a lot of good girl shooters," he said. "I figured she would beat me at the end of it. It's what she likes to do and she's good at it." KayLee will be back to the high school rodeo trap shoot again this June. And another year of experience has made her more sure of herself. "It gives me confidence," she said. "It gives me the courage to think a girl can do what a guy can do, and you can't tell us we can't. And if you tell us, we'll prove you wrong."